Nest​ ​Black​ ​Friday.​ ​Saving​ ​is​ ​beautiful. - AC SUPPLY CO.
Nest​ ​Black​ ​Friday.​ ​Saving​ ​is​ ​beautiful. Home / Promotion / Nest​ ​Black​ ​Friday.​ ​Saving​ ​is​ ​beautiful. 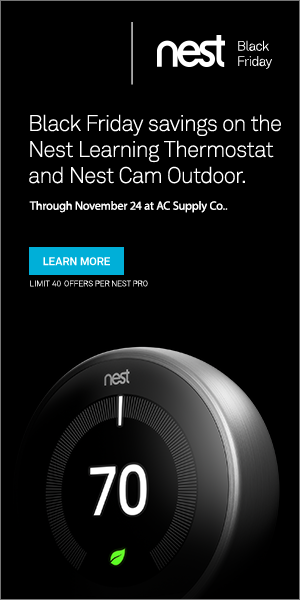 Black​ ​Friday,​ ​save​ ​on​ ​the​ ​Nest​ ​Learning​ ​Thermostat​ ​and​ ​Nest​ ​Cam​ ​Outdoor.​ ​The​ ​Nest Thermostat​ ​keeps​ ​your​ ​customers​ ​comfortable​ ​and​ ​helps​ ​save​ ​energy.​ ​And​ ​the​ ​Nest​ ​Cam Outdoor​ ​security​ ​camera​ ​helps​ ​your​ ​customers​ ​look​ ​after​ ​their​ ​home,​ ​even​ ​when​ ​they’re​ ​away. The​ ​more​ ​you​ ​purchase,​ ​the​ ​more​ ​you​ ​save. *​ ​Become​ ​a​ ​Nest​ ​Pro​ ​and​ ​grow​ ​your​ ​business​ ​with Nest’s​ ​award-winning​ ​connected​ ​home​ ​products. Now​ ​through​ ​November​ ​24​ ​at​ ​AC Supply Co.